Manufacturer of a wide range of products which include photovoltaic surge protection device and surge protection devices for pv installation. We are the leading manufacturer and suppliers of solar photovoltaic lighting systems. We offer the best surge protection devices for solar pv. Solar surge protection devices are the perfect medium to save cells & Inverters DC Side. We also provide Photovoltaic Surge Protection them for varied other common voltages in small-scale systems and power systems (500 to 1000 Vdc). The rail-mountable components of Surge Protection for Solar Photovoltaic (PV) System are designed to protect insulated as well as solidly grounded systems. We offer an array of Solar Photovoltaic (PV) System to assure protection against lightning surge voltages in photovoltaic power supply networks. They should be installed in parallel on the DC networks to keep them safe and offer common as well as differential modes protection. The BDL/40/C/PV series, offered by us, is presented for the main operating voltages in photovoltaic: 1000 Vdc. Our assortment of dc-voltage photovoltaic system can be easily used at both ends of the DC power supply line (solar panel side and inverter/converter side), mainly if the line routing is exterior and long. We ensure to design photovoltaic surge protector that provides long life performance without any kind of abrasion and maintenance. We are The leading manufacturer, supplier and exporter of Surge Protection Devices for PV Installations. These are manufactured from state of the art technology and high grade raw material. Our products comply to the national and international standards. Solar Surge Arresters / Photovoltaic Surge Protection offer protection in small-scale systems and power systems (200, 300, 500, 1000 VDC). 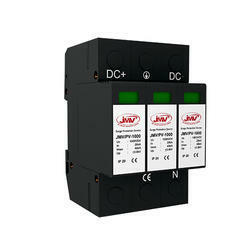 Looking for Solar Surge Suppressor ?